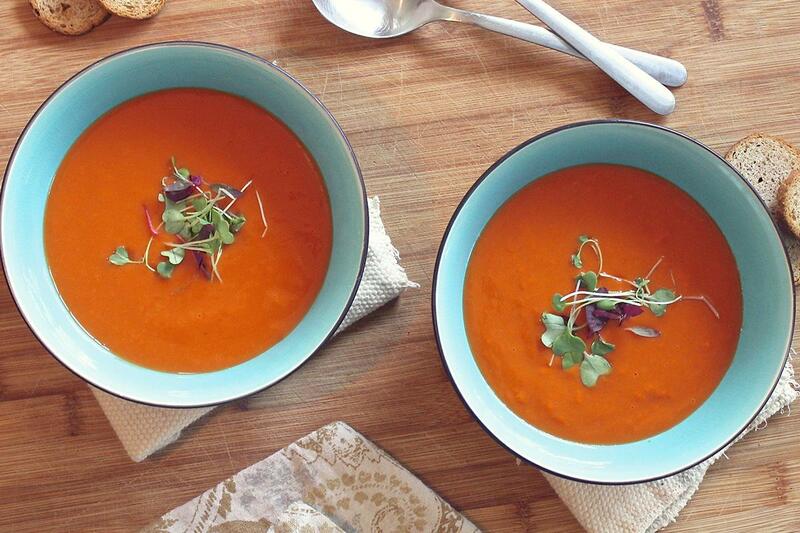 Warm up this winter with a comforting bowl of homemade soup. While pre-packaged soups, instant soups, and canned soups are readily available, a soup made from scratch wins every time. Here are three of our favourite soup recipes to get your winter warmer arsenal started. 1. Peel and scoop seeds out of the butternuts, and chop it into small cubes and dice onions and garlic. Halve the green chillies and scrape out the seeds then dice finely. 2 In a large saucepan melt the butter and add the chopped vegetables except for the butternut. Cook over a moderate heat and cook until the onions are soft and transparent. 3. Add the lemon juice and chicken or vegetable stock and stir until well mixed. 4. Add the water and the cubes of butternut, and simmer for about an about 1 hour until the butternut is soft and the flavours are well combined. 5. Blend with a hand held blender. 6. Serve hot with a generous drizzle of olive oil, pouring cream and decorate with toasted pumpkin seeds. 2. Add the onion and carrots and allow to cook for 8-10 minutes or until tender. 4. Add the tomatoes, tomato paste, basil, chicken stock, salt, and pepper and stir well. 5. Bring the soup to a boil, then lower the heat and let simmer uncovered for 30 minutes. 6. Use a hand held blender and blend until pureed. 7. Return to the pot and gently stir in the pouring cream. 8. Season to taste with any additional salt and/or pepper and fresh basil leaves. *Quick Tip: if you are looking to add a little spice to your tomato soup, dice 3 green chilies and add to the pot with the onions and carrots. 1. Melt the butter in a large, heavy based saucepan over a medium heat and gently fry the onions, celery and carrots until they begin to soften. 2. Stir in the flour and cook for 2 minutes. Add the chicken stock and bring the mixture to the boil, stirring as you pour to prevent and lumps from forming. 3. Season to taste with salt and pepper, then reduce the heat to a simmer for 10 minutes or until the vegetables are tender. 4. Add the cooked chicken and cook until heated through. Adjust the seasoning, stir in the parsley and serve. Soups are a hearty and honest dish whose rustic origins have given them a delightful, cosy feeling. Enjoy these three soups this winter and experiment to make your own.